The International Conference on Optics of Surfaces and Interfaces (OSI) is a well established biennial meeting that gathers researchers from all over the world from diverse fields of surface/interface optics, including nano-systems and metamaterials. The last conference was held with great success at Trinity College in Dublin, Ireland in the summer of 2017. This is the thirteenth edition of the conference (OSI-13), and it will take place in the city of Leon, Guanajuato in Mexico, on the week of June 3-7, 2019. 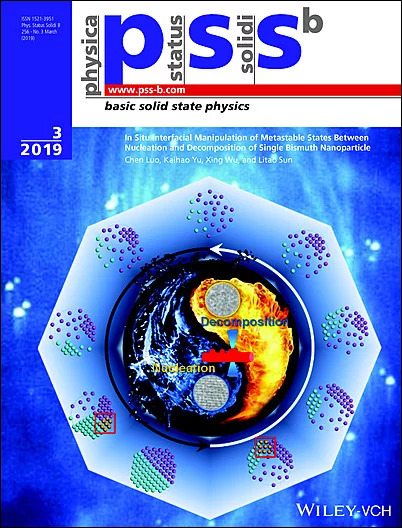 Following a series of successful publications from previous Optics of Surfaces and Interfaces (OSI) meetings and related to this year's OSI-13 in León, Mexico (June 3-7), it is planned to publish a regular topical section (no conference proceedings) with selected contributions on the diverse aspects of surface optics research in pss (b) - basic solid state physics. In collaboration between the Guest Editor and the pss Editorial Office we cordially invite you to contribute a Feature Article (topical review, for invited speakers) or Original Paper manuscript based on or related to your conference presentation. All submitted manuscripts will undergo peer review. According to the editorial policy of pss, two positive recommendations by independent reviewers are a prerequisite of acceptance. Peer review and publication occur rapidly on individual manuscript basis. Published in Wiley Online Library Early View few weeks after acceptance, your article is citable immediately; hence there is no waiting for the remainder of the contributions. When all articles are complete, the topical section will be assembled in a regular monthly issue of pss (b). The clustering of related articles raises the visibility of these articles significantly, and we are confident that this will become a quality publication reflected by high article access and citation numbers. * Companion fees only include social activities: Welcome cocktail, conference banquet, and social activities/excursions. The registration cost includes access to every plenary session, daily lunch, conference banquet, coffee breaks, conference materials, the welcome cocktail, and social activities/excursions. Early bird registration before April 30: 10% discount on total registration cost. Address: CIO Centro de Investigaciones en Optica, A.C.